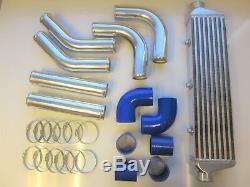 Universal Intercooler Kit 63mm (2.5) - BLUE HOSES. Bar and Plate Front Mount Intercooler. 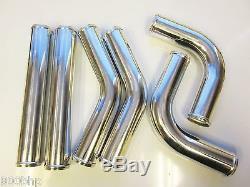 Alloy Pipes - 6061 Alloy, Polished with Rolled Ends. 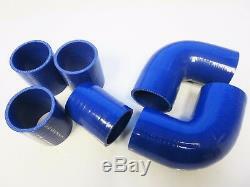 Silicone Hose Joiners - Multi-Ply Silicone in BLUE. Intercooler 550x140x65 Core (Overall width 700mm at widest point). 63mm (2.5) x 300mm Straight Alloy Pipe - QTY 2. 63mm (2.5) x 90 Degree Alloy Elbow - QTY 2. 63mm (2.5) x 45 Degree Alloy Elbow - QTY 2. 63mm (2.5) Straight BLUE Silicone Joiners - QTY 4. 63mm (2.5) 90 Degree BLUE Silicone Elbows - QTY 2. 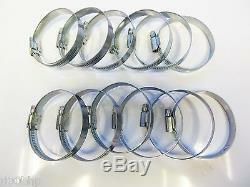 Hose Clamps - QTY 12 (2 for each silicone hose). Note : Universal kit so some modification / additional parts may be required, fitment by specialist recommended. All parts are available separately if additional parts are required. This kit is also available with different intercoolers, colours, diameters, clamps (please see our other listings). The item "Universal Front Mount Intercooler Kit FMIC 63mm 2.5 BLUE HOSES 550x140x65 Core" is in sale since Saturday, August 26, 2017. This item is in the category "Vehicle Parts & Accessories\Car Tuning & Styling\Air Intake & Induction\Intercoolers". The seller is "800bhp" and is located in Hinckley. This item can be shipped worldwide.